Use Honorariums (Memorials) to enable contributors to specify their inspiration to give such as in memory of someone. There is also the option to display honorariums on the online giving page. 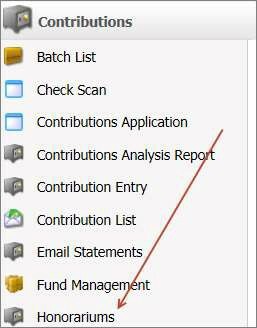 Both public and non-public honorariums are available internally for batch processing on the Contribution Entry page. 1. 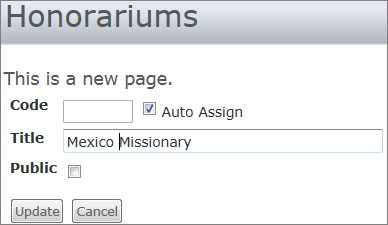 From the Contributions menu, click the Honorariums option. 2. Enter a Code for the honorarium or leave Auto Assign selected. 3. Enter the honorarium Title. 4. Select Public to enable online giving. Regardless of checking public, the honorarium is available when processing contributions.